…add a red onion, pungent spices straight from the Moroccan souk like ras el hanout and sumac, a dash of brown sugar, salty crumbled feta, fat cherry tomatoes and tender minced chicken. Finish with a shower of chopped coriander and mint. There’s a real balancing act to this dish – it’s sweet, salty, tart, rich and spicy . The recipe comes from Australian food writer and blogger Katrina Meynink’s book Kitchen Coquette, which won best first cook book at the Australia Gourmand Cookbook Awards in 2012. I spied the dish in last week’s Stylist magazine and cooked it this week for a quick, filling supper served with crushed new potatoes, simply because it sounded so delicious. Looking at Katrina’s blog, the other crumb, many of her recipes are bold and punchy like this one. How does a Turkish delight and pistachio doughnut called a ‘Fonut’ sound? Or, chocolate molleux with malted milk caramel? This Turkish eggs recipe appealed to me partly because I wanted to see how minced chicken meatballs would work out. So often I think chicken breasts end up at best bland, worst dry, but there was no way the spiced, diced and neatly browned chicken in this recipe was going to end up in that camp. I actually chopped the two chicken breasts (500g costing £8) up nice and fine, rather than risking blitzing the meat into mush. The egg in the meatball mix acts to bind the meat and it’s useful to have a pair of tongs to gently turn the meatballs as they brown. Two large chicken breasts stretched to make enough for four people and, because of the abundant tomatoes, egg and feta, you don’t feel cheated of chicken. Oh, and it cooks in one pan, so less washing up. My one tweak would be that I found the chicken doesn’t need so quite so long to cook as the recipe says. I’d actually brown the meatballs, take them out of the pan then return them to the pan only once the tomato sauce had reduced by half (as I’ve written below), rather than have them cooking in the pan all that time. Welcome to Turkey (albeit on a warm English summer’s evening). Enjoy. This recipe is enough to serve four people, or two people with enough for lunch the next day! Chop the chicken finely, almost as if you were chopping an onion. Place this, half the finely-chopped red onion, the crushed spices, garlic and egg in a bowl. Season then mix with your hands and roll into walnut-sized balls. Heat the oil and saute the rest of the onion until soft. Remove from the pan and place to one side then add the meatballs to the hot oil and brown all over. Take them out of the pan before they finish cooking. Into the same pan, now return the fried onion along with the tin of tomatoes and brown sugar. Cook for about 10 minutes or until the sauce is reduced by half. 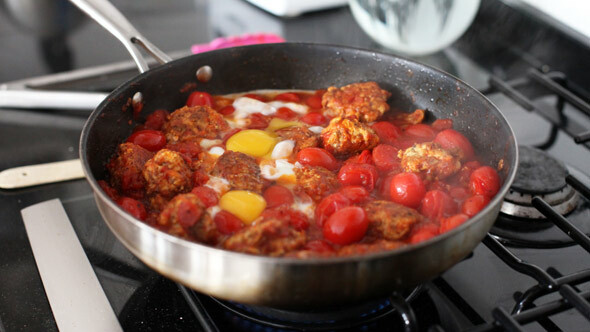 Add the cherry tomatoes and chicken balls and cook until the cherry tomatoes soften and skins begin to split. Crack the eggs gently into the centre of the mixture – ideally you don’t want the yolks to burst, but no worries if they do. Cook for about three minutes or until the eggs are done to your liking. I found it helpful to nudge the area around the egg white gently as they cooked so it flowed into nooks and crannies and cooked more evenly. 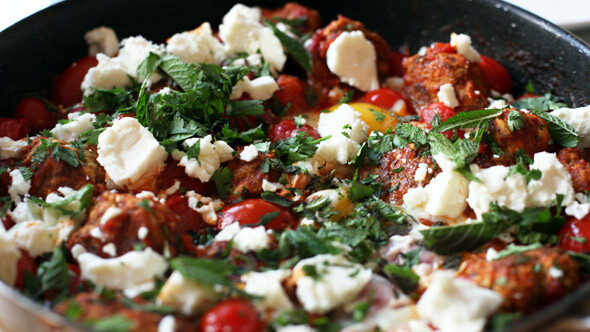 Scatter over the feta and herbs then carry the whole pan to the table. 10 Jul	This entry was published on July 10, 2013 at 9:21 pm. It’s filed under Bloggers, Dinner, Healthy, Middle Eastern, Recipes and tagged Chicken, dinner, eggs, feta, Katrina Meynink, Kitchen Coquette, Middle Eastern, one pot, spices, summer, thelittlecrumb, tomato sauce, Turkish food. Bookmark the permalink. Follow any comments here with the RSS feed for this post.